CARTILAGE | Microanatomy Web Atlas | Gwen V. Childs, Ph.D.
Hyaline cartilage contains cells called chondrocytes embedded in a unique matrix that gives the tissue both strength and flexibility. Review the components of the matrix. 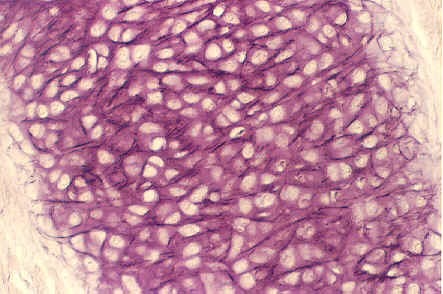 Find hyaline cartilage in your trachea slide, and look for the chondrocytes housed in their spaces called "lacunae". The photos are from the trachea slide. Note that some spaces contain more than one chondrocyte...these are daughter cells formed after division. 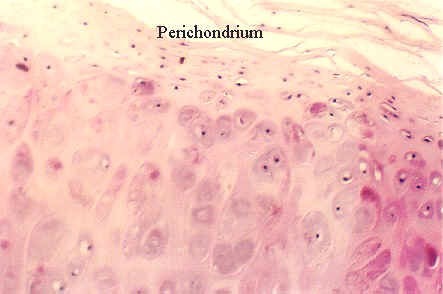 Also note the outside of the cartilage tissue is connective tissue called "perichondrium".. Layers of "chondroblasts" are found in the inner layers. They give rise to new chondrocytes as they secrete matrix around themselves. Cartilage can grow from the outside (appositional growth) and from within (interstitial growth). Considering the absence of blood vessels in cartilage, why do you think the content and organization of the matrix is so important? The cartilage in the ear contains many elastic fibers and is therefore called "elastic cartilage”. 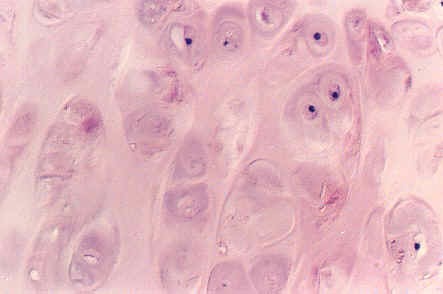 Elastic cartilage can be distinguished by the stain for elastin that brings out the dense bundles. 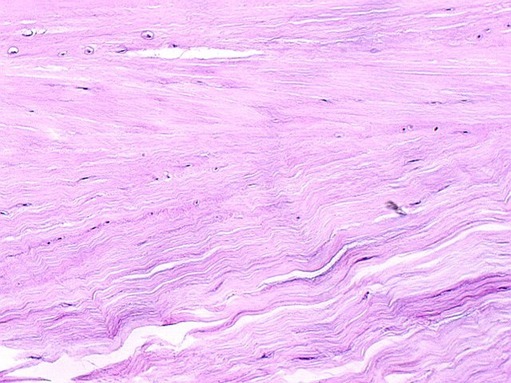 This section shows fibrocartilage from an intervertebral disk. It is distinguished by very scattered, infrequent chondrocytes (see the tiny dark nuclei) and collagen fibers running in the matrix.